I’m not a gambler. That’s because my father was. Even a little bit of his meagre income squandered on the ponies had a significant impact on that week’s meals and the one time he won more than a week’s wages did not make up for that. I was once the owner of sailboat, which, they say is like standing in a cold shower tearing up hundred dollar bills. The difference between that and gambling, in my mind, is that with gambling, you skip the shower. And yet I find myself in Las Vegas from time to time, staying in a hotel. On Christmas Eve it was the Palms. We had chosen the Palms because one of us had stayed there last Christmas and reported that with wood panelled rooms it had a warm vibe . Besides the rooms were going cheap. How surprised we were to find there had been a total renovation. 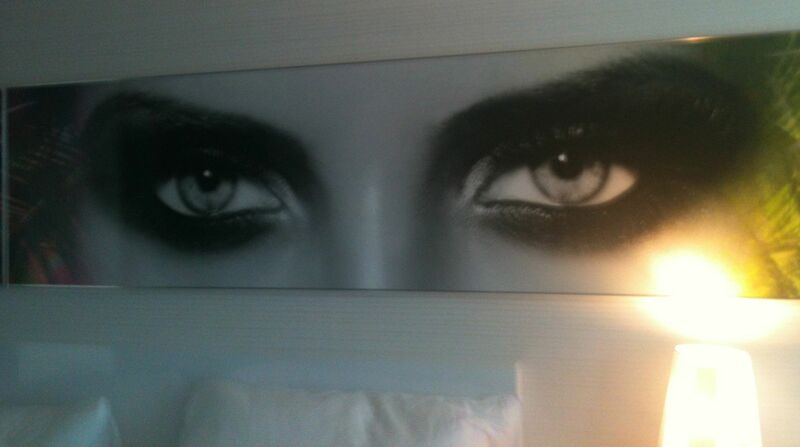 Now the tigerlike eyes of a woman, framed by palm fronds gazed down over every bed. The bathtubs had been removed and replaced by showers big enough to accommodate a small crowd behind transparent plexiglass. The coffee makers had gone the way of the bathtubs. This meant that whenever I wanted tea, I had to travel down to the cafe to get hot water. On Christmas morning at 5 a.m., I made my way there to discover that the usually crowded casino had only three diehards, eyes glued to their slot machines. For as you may know, the casino in any Las Vegas hotel is unavoidable. You enter through it. You cross it to get to the front desk. You recross it to get to the elevator and every time you want to buy a bottle of water or get a meal or go out to visit a relative. Initially, the noise drove me crazy, but I have found that it’s like traffic when you’re driving. Pay attention only to what’s relevant. The Las Vegas that I know is not party central. It is a more suburban experience where neat Spanish-style bungalows line curving streets. Twice we have rented houses big enough to accommodate the extended family gathered from across the continent. The first one could have slept about 20, but it had a few disadvantages. One of the toilets roared when flushed and on the wedding day, the city turned off the water for non-payment. The other was smaller although it still had room for 10 and a pool where you could escape the summer heat. You could escape it in the house as well, but the air conditioning was so fierce that you risked frostbite. Some of us devised a strategy: we stayed inside until we got chilled, then we sat outside until we got fried even with pool breaks. The kids of course just stayed in the water until about 10 p.m. Party central, yes, but…. We did stay at the Monte Carlo on the strip one year and I was bowled over by the Babylonian opulence of it all. I sat waiting for kids to get off the rides in New York, New York. The fountains at the Bellagio alone were worth the trip, not to mention the buffet despite the line-up. Ah, the buffet! Las Vegas has cheap buffets, breakfast, lunch and dinner. Like the reasonably priced drinks you can get at the casino bars, the food and even the room is just a ploy to keep the gambler feeding the machines money. Meanwhile feast your eyes on a glass pyramid, an Eiffel Tower and other bizarre edifices that delight a playful heart, never more than when the lights come on at night. We go there for weddings and funerals and, sometimes, for Christmas. Thanks to the bold imagination of 2 family members who upped stakes and moved there in their retirement and who never played more than the nickle machines, Las Vegas has a homey feel.